Spark!Lab visitors have been enjoying inventive activities since opening day in 2015. I have seen hundreds of thousands of people come into Draper Spark!Lab since the summer of 2015. Although some visitors to a given exhibit will leave dissatisfied (that’s just the nature of a museum environment), time and again it becomes abundantly clear people love our invention lab. What’s so great about Spark!Lab? Why is it so common for visitors to tell me on their way out, “This is a great place you’ve got here”? What explanation could you possibly give for the overwhelmingly positive sentiments people throw our way? The answer, I believe, is in the audiences. Take a close look at how the exhibition fulfills the needs of specific subsections of the public, and you begin to understand the thoroughness with which it provides the carefully-crafted experiences visitors are looking for. We don’t necessarily think of our particular visitors by sorting them into the same categories that museum researchers use. (In fact, the Lemelson Center’s key message that “everyone is inventive” implores us to think of inventing as a fundamentally inclusive activity.) However, it is reassuring to know that, when we apply theoretical frameworks from the field of museum research, we already work every day to build Spark!Lab in a way that provides for each category of visitor. For every single museum visitor, the sense of being happy with the visit comes directly from an internal conversation (conscious or subconscious) between the visitor’s perceived needs and the degree to which the institution fulfilled those needs. It’s not the most recent research, but it’s the book I read last year on my long work commutes, so I’ll share it: Identity and the Museum Visitor Experience written by John Falk. This book works very hard to establish, among other things, a framework for understanding how the motivations of the museum visitor dictate how they perceive their visit is going and, in turn, how they will remember their visit afterwards. I think the framework, which describes five main types of visitors, is useful for our purposes. For our visitors, then, the level of perceived “happiness”—or how much “fun” or “contentedness” they feel—directly relates to how closely their expectations and their experience align. The definition that particular person uses to describe what he or she wants out of today’s visit is the operating detail here. That definition determines the trajectory of the experience, and it also serves as a criterion afterwards for assessing how happy they feel and evaluating the visit’s worth. As a result, among our most important objectives is to integrate the most effective mechanisms to orient visitors to the self-directed activities and content they most desire. Falk describes his so-called “Facilitator” type of museum visitor as a person who wants to “engage in a meaningful social experience with someone whom they care about in an educationally supportive environment” (see page 64 of that book I mentioned). We can realistically assume (and corroborate with informal and formal evaluation data) that many people in our room come with a family or other similar unit. Given this portrait, a great number of Spark!Lab visitors probably derive their happiness from a sense that their family gained a valuable (and hopefully fun) learning experience. Of course, virtually every part of our exhibit is designed to provide some kind of learning opportunity. Excitement and engagement, meanwhile, are central to our design. Subcategories of Falk’s “Facilitator” visitor type include “Facilitating Parents” and “Facilitating Socializers.” You can clearly see in the previous examples how adults, looking to please or indulge (or simply entertain!) their children or grandchildren, might use Spark!Lab. Facilitating Socializers, meanwhile, might be hosting another adult relative or friend. We have developed a built-in orientation for these kinds of visitors, writing it into our script for the yellow-aproned greeter at Spark!Lab’s front-door. Visitors are more than welcome to enter without children, we explain, and not only may they browse the museum’s collections of historical inventions—they may also participate in the invention process themselves. 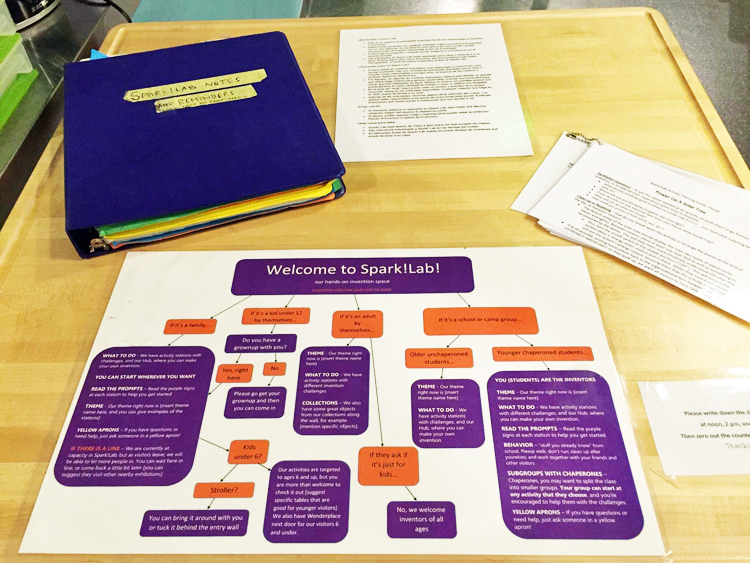 Spark!Lab staff have developed strategies to help fulfill the needs of common visitor types. This flowchart helps us provide relevant information as we greet visitors. Not everyone shows up to the invention lab on purpose, though. When I’m greeting new visitors to Spark!Lab, sometimes it is immediately evident that a given group only just now discovered the existence of our room, and they did not come specifically to this wing of the museum with any particular intentions. Ask any of our seasoned staff members or volunteers, and they will probably tell you that a good deal of the visitors they encounter are simply browsing around the building. These visitors aren’t conceptualizing the institution as a means to achieve a specific objective, but that doesn’t mean we can’t cater to their needs as well. Of course, these visitors are just as welcome to participate in the invention process, and most of them end up spending a good deal of time in our room once they discover it. Where we really come in for these people, though, is in providing resources, wayfinding, and other tips. 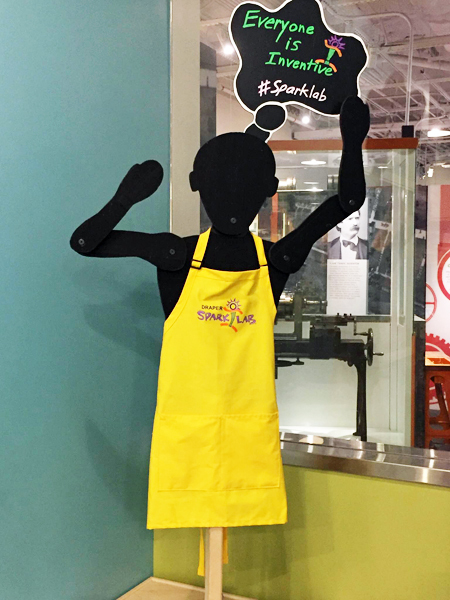 Everyone wearing a yellow apron in Spark!Lab is a living resource in this regard. We also have maps in the corner of Spark!Lab, and visitors can pick up those as they exit. Strategies for extending the experience allow Explorers to pick up where they left off on their inventing activities at home, which frees up time during their visit to continue exploring (e.g., “Right now we can go see the museum’s other cool things”). Our staff trains the yellow-aproned volunteers in explicit strategies for helping interested parties gently nudge their inventors towards the next activity or the door, without giving the impression that they have to give up on the project entirely. The purple Inventor’s Notebooks are also a powerful tool. Hand these booklets to a parent or to a child, and so many possibilities are unlocked: They can read about the steps of the invention process, which can expedite or expand their experience in thinking about their inventive idea. Similarly, adults might opt to grab a couple sheets from the Sketching Station or take pictures or video of the child’s prototype, which can assist them later as they create subsequent iterations of the invention at home. Being located at the National Museum of American History in a destination town like Washington, DC means our invention lab receives all kinds of visitors from afar. I’ve met people from so many countries; it’s difficult to list them. Since tourists tend to view their trip as a conglomeration of many discrete experiences, their agenda can sometimes begin to resemble a checklist. The interest of such visitors, according to Falk, is to check off the proverbial boxes of their list of to-dos and must-sees. For these visitors we provide guidance that focuses on the most popular attractions and functional features in the building. These suggestions typically include the location of: the Star-Spangled Banner, Dorothy’s slippers from The Wizard of Oz, the cafeteria and café, bathrooms, or exits. In fact, as part of training for our new volunteers, we build time into the schedule for them to go around the museum themselves, simulating the experience of our typical visitors in a scavenger-hunt format. Our volunteers know exactly where to send inquiring visitors because they have physically gone to the trouble themselves of finding the important places and things in the museum. To give visitors what they want, however, our staff and volunteers need to practice active-listening strategies. We proffer suggestions and guidance only after we have already thoroughly assessed what the visitor is looking for, never assuming we know what’s best for them beforehand. From time to time, professionals and hobbyists arrive with a specific objective in mind, usually to gather ideas for the educational experiences they are crafting for their own students or children. Sometimes these people are associated with a particular group with whom the Lemelson Center staff is collaborating; other times, we happen to find out in conversation with a visitor that they have their own fourth-grade class, for instance, that’s about to begin an instructional unit on innovation or some other topic. Whatever the case, “Professional/Hobbyist” types benefit greatly from a detailed explanation of each section of our room. Then, once they have taken pictures of the invention activities and grabbed the consumable stuff for later reference, they are ready to get inspired with their own ideas for their kids’ learning activities. The Thinking Spot is located in Spark!Lab's back corner. Parents use this area to read invention stories to their younger children and rest up for the next stage of their visit. In the cases of still other visitors, the main focus is to sit down! As he describes the “Recharger” type of visitor, Falk explains the kind of very real situation we see all too often in the busy world of museum “leisure.” When our visitors have been walking around for a very long time seeing monuments and museums, and they have taken in so much information throughout the duration of their stay in Washington, DC, and they have been putting up with Uncle George for the whole vacation, and it’s been a week since they have slept in their own bed . . . sometimes, all they want is a quiet place to rest. Go back to Spark!Lab’s Thinking Spot, friend, and take a load off for now. Invention is a process, after all, and you can always pick it up after you walk out our door. We’re just glad to have helped in the meantime.